During the month of December Crown Center brings in bus after bus of children's choirs to belt out the holiday classics. If you are looking for peace and quiet, go somewhere else, because no place does Christmas as well as Crown Center. In elementary school each grade had a different program they performed year after year. Third graders got the Christmas program. My class got to sing Jingle Bell Rock, which was the coolest Christmas song there was. To make it even better the girls all got to wear poodle skirts. 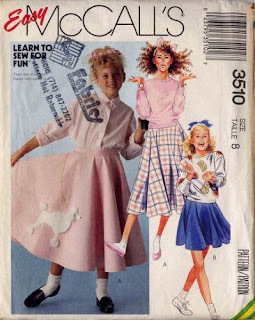 I say we got to wear them because I was a kid; the parents probably said we HAD to wear them because they had to find/make one for the program. I don't know if I ever felt cooler than I did that night. My class got to sing a "rock and roll" Christmas song and spin around in our super cool skirts. I was sure every other class was jealous of us. To this day every time I hear Jingle Bell Rock come on the radio I swell with pride thinking about the time I was the cool kid. We were pretty much just singing and dancing for all the third graders parents, but it was exciting and it still stands out in my list of childhood memories. The kids here at Crown Center are singing for hundreds of strangers and I imagine this is a big moment for some of them. There are cameras flashing everywhere and you can see people on the 2nd and 3rd floors looking down on the choir. What a rock star moment! Thank you, Crown Center, for allowing all of these kids to have their moment in spotlight.